I just love a good hamburger steak. I grew up eating them. I’m sure we all did. And sometimes there is just nothing quite like it. Often times, my mother would wrap a piece of bacon around the edges of each one for even more flavor. It’s important to get your pan screaming hot when you put the patties in there. The trick is to get the dark brown color on them like the picture above. That’s where all that delicious flavor comes from. 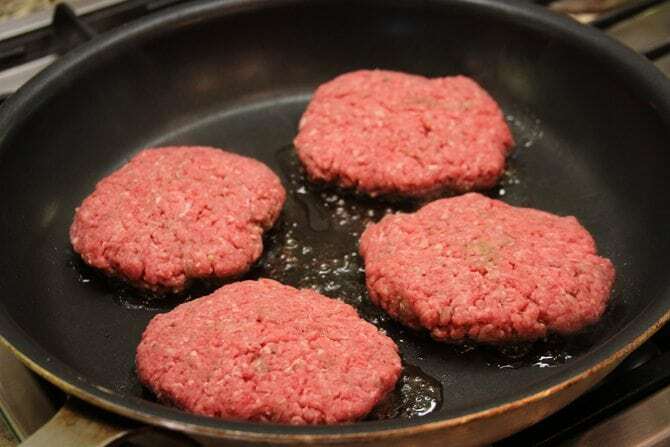 Put them in the skillet and don’t touch them until you flip them. Serious, hands off! Now that’s some deliciousness right there, folks! We usually served these with mashed potatoes and a vegetable, but they are great served along rice or even french fries – if you want! 🙂 Y’all enjoy! Simmer and stir over medium-low heat for about 5 minutes, until the gravy thickens. Turn heat to low, return patties to the gravy, cover, and simmer for another 15 minutes. Serve with a big bowl of mashed potatoes.